By the age of 14, harpist Hannah Allaway, had gained Grade 8 exam passes with distinction on harp, piano and clarinet. She also achieved a level 6 Diploma in Music (LTCL) as a 17 year old. Hannah loves playing the harp, especially her own arrangements of modern music. 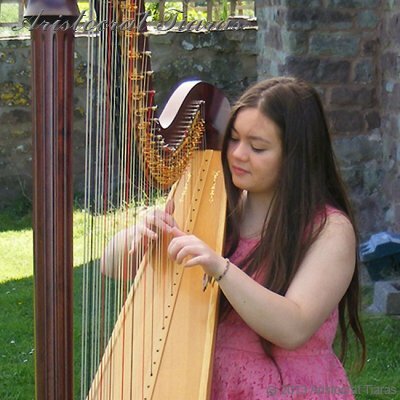 Hannah was principal harpist with the National Children's Orchestras of Great Britain's Main Orchestra in 2011 and 2012 and played both harp and celeste with the NCO in Westminster Hall at a lunch hosted for the Queen on 5th June 2012 as part of the Jubilee celebrations. Hannah played harp with the NCO for 5 years and has recently "retired" having reached the NCO's upper age limit of 14! She's played with the orchestra at venues across England including The Sage Gateshead; Colston Hall, Bristol; Town Hall and Symphony Hall, Birmingham; The Anvil, Basingstoke and the Queen Elizabeth Hall, St Johh's, Smith Square and Cadogan Hall in London. Hannah is currently principle harpist with the National Youth Orchestra (NYO) having been a member of the Orchestra since 2014. She has played at numerous venues with the NYO inluding the BBC Proms at the Royal Albert Hall twice and a concert tour to Germany. She has performed as a harpist with the City of Birmingham Symphony Orchestra's Youth Orchestra. Hannah has won prizes in a number of music festivals in Mid Wales, Herefordshire and the Midlands. Hannah regularly plays piano for a chapel service in the hills of the Welsh borderlands and has occasionally played piano in concert with the NCO. She is also a clarinettist with the Herefordshire Youth Concert Band. Hannah plays harp regularly at weddings, birthday parties and functions. If you are looking for a wedding harpist for your wedding or special occassion in Herefordshire or the surrounding area such as Radnorshire, Powys, Mid-wales, Worcestershire, Midlands etc, please get in touch. Please contact us to enquire about Hannah playing at your wedding.